In one year, there are around 2,200 deaths from alcohol overdose. Binge drinking, the action of drinking over 5 drinks in one short time period, is what most often leads to this type of alcohol poisoning. Drinking games may be fun, but many of them promote binge drinking and uncontrolled drinking. Uncontrolled drinking, not planning out or limiting how much you are going to drink, is an inherent risk for drinking too much alcohol at once. All sorts of things can lead to getting carried away with alcohol like peer pressure, the desire to fit in, lacking self-control after you drink a certain amount of shots, drowning out the world if life seems cruel, or a predisposition to alcohol abuse that runs in the family. Sometimes people do not plan to drink much, but after a few shots they figure, what more could hurt? To prevent yourself from needing substance abuse help from an overdose, you need to know your drink content. A U.S. drink usually has about 0.6 ounces of alcohol which can take different forms depending on what you decide to drink. 12 ounces of beer contains 5% of pure alcohol, an 8-ounce malt liquor has 7% alcohol, 5-ounce wine has 12% alcohol, and a shot glass of liquor contains 40% of alcohol in it. Double-checking the alcohol proof of whichever drink you decide to try is one way to avoid over-drinking. The alcohol proof, or percentage of pure alcohol, is almost always found on the bottle or can itself. Alcohol counseling can help you develop more skills to control your drinking. While the human body is versatile in getting rid of toxins like alcohol successfully with only a few minor side effects in the form of a hangover, the body is no miracle machine. The body has limits like anything else around us and if you make the body work too hard, the body shuts down. With no breathing or heart rate, you have overdose. Understanding how your brain and body are affected by the different levels of alcohol in your body helps in understanding why too much alcohol consumption can eventually lead to death. When you first start drinking and reach a Blood Alcohol Content (BAC) of 0.05%, you will only experience mild memory, attention, balance, and speech impairments. You will also feel relaxed with less concern about any daily struggles you may be dealing with. This effect is what often leads someone to need help from alcohol counseling if they become dependent on alcohol to relax for 24 hours a day. At a BAC of 0.06%-0.15%, you may become aggressive and that will increase your risk on injuring yourself or others. Your memory, attention, and speech will be noticeably impaired, so people will know you have been drinking. However, if you reach 0.16%-0.30% BAC, you will start experiencing the negative sides of alcohol like blackouts, lapses in time due to dysfunctional memory, vomiting, and passing out. Your judgement will be so impaired that you might make regrettable decisions. You will barely be able to walk or talk correctly. When you reach a BAC of 0.31%-0.45%, you are playing with death. This is when most people pass out for real and their organs start shutting down. Certain organs like the kidneys, lungs, heart, and brain are necessary for life. It is at this point, that substance abuse help should be sought. There are a few things you can do while waiting for emergency services to arrive. Try your best, even if you are intoxicated, to explain to the hospital on the phone how much alcohol you or the person you are helping, drank. This speeds up the overall process. If the person makes choking sounds or vomits, make sure you turn them on their side. Do not induce vomiting either if they are close to unconsciousness. Try to keep them awake as much as possible, but do not use a strong stimulant like cocaine, coffee, or an energy drink to do this because that could put too much strain on the liver. Alcohol makes us feel relaxed because this substance binds to the same receptor sites that are involved in sleep. GABA is an inhibitory neurotransmitter in the brain that binds to GABA receptors on neurons to induce relaxation and other functions related to sleep. Alcohol successfully mimics GABA as an agonist, so alcohol also makes you feel sleepy. 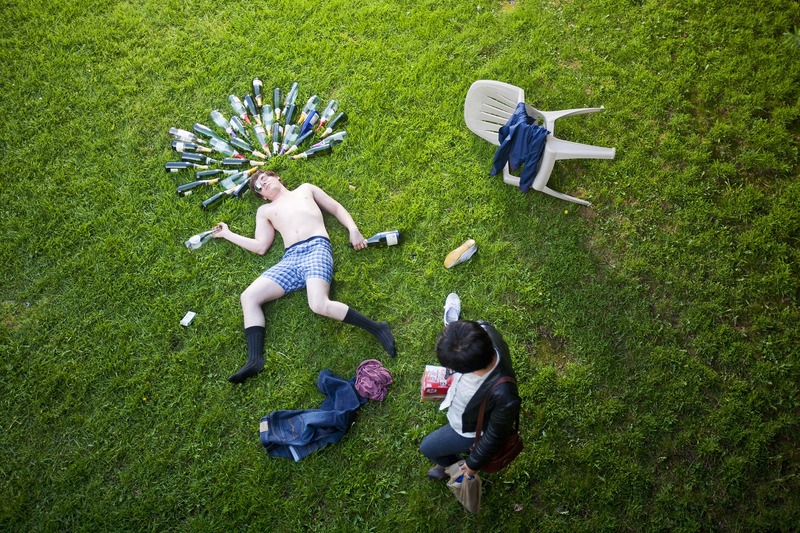 However, too much alcohol makes people too sleepy, to the extent of permanent sleep. The biological reasons people die from too much alcohol have to do with exactly that, too much inhibition of the nervous system. This inhibition leads to significantly lower activity of involuntary actions in the body like breathing and the gag reflex, which is key for preventing someone from choking on vomit. At the Recover, we empathize with the fact that alcohol can be enjoyable and effectively take the edge off if you need a brief break from work. However, we know that uncontrolled drinking can lead to several bad decisions and outcomes that are not worth the risk. If you are looking for guidance, look into alcohol counseling, which can provide you with skills for managing your drinking while still having fun. The Recover is an unbiased substance abuse and mental health news provider that presents people with information on substance addiction. We also provide information about West Virginia centers for addiction recovery. If you are struggling with controlling your alcohol intake, then call us at (888) 510-3898 to talk to a treatment specialist who can help you find a substance abuse help program that fits what you are looking for.